· Plug-in architecture - Integrate with other servers, back-end services, and workflows with the new plug-in architecture. Three classes of plug-ins for authorization, server access, and file access let you extend Adobe Flash Media Interactive Server 3.5 software with custom connectivity, security, and deployment options. · MPEG-4 video recording - Archive high-quality live streams on the server so you can quickly deploy any live stream via on-demand quickly after your live event is over. · AMF3 support - With the addition of AMF3 support, take advantage of a much more flexible tool for data sharing and even richer possibilities for interactive applications deployed through the Adobe Flash Player runtime and the Adobe Flex environment. · DVR functionality - Create high definition DVR functionality with new support for H.264 stream recording. Pause a live stream, or seek backwards into the video that was missed. · XMP metadata support - Enjoy support for streaming XMP metadata created by video production tools that write it into the file. With XMP metadata, you can search on text within a video stream. · Dynamic Streaming - Keep your viewers longer with a better viewing experience, no matter what their connection speed is. Dynamic Streaming is a new quality-of-service monitoring feature that lets you detect any changes in your viewer's bandwidth and smoothly switch between streams during playback â€' helping to ensure a high-quality, uninterrupted stream. Dynamic Streaming uses standard H.264 and VP6 files and is ActionScript controlled. · Faster server and scalability - Deliver more streams and users per server with less CPU usage, lowering your streaming and infrastructure costs. Video streaming capacity is improved for H.264 content with Flash Media Interactive Server 3.5. Flash Media Interactive Server can serve as either an Origin or an Edge, features previously found in Flash Media Server 2.0, to allow for virtually unlimited scalability. · Easier implementation - Get started right away with easier out-of-the-box deployment. Flash Media Interactive Server 3.5 makes it easy with features such as new ActionScript classes for Dynamic Streaming, a new load simulator tool (coming soon) to test your network, delivery of encrypted media to the Adobe AIR runtime and Adobe Media Player software, and support for more platforms, including Microsoft Windows Server 2008 and Linux Red Hat 5.2. · More secure content delivery - Lock down your high-definition content and communications with enhanced stream protection and server-side security. Encrypted H.264 streaming is now supported â€' with the encrypted Real Time Messaging Protocol (RTMPE), you get higher performance at 128-bit encryption strength. In edition with RTMPE, protect SWF files from being reused or modified, and help prevent unauthorized connections with improved SWF verification. Use the plug-in architecture to create custom, real-time rights control by validating with external services such as LDAP or SOAP. · Reliable delivery protocols - Help ensure that your content is easily and reliably delivered, even when RTMP delivery is not supported. You can now use this integrated solution to deliver all components of your video application via HTTP when needed. · H.264 video and HE-AAC audio - Enable up to 1080p HD delivery to Adobe Flash Player, Adobe AIR, and Adobe Media Player with industry-standard H.264 video and HE-AAC audio streaming. Given the broad support of H.264 video in the industry, customers can leverage most of their existing encoded content without having to reencode, helping reduce the cost of delivery. · Live HD/H.264 video streaming - Get robust, high-performance live streaming of H.264 and On2 VP6 video in conjunction with Adobe Flash Media Live Encoder 2.5 software, enabling you to deliver around-the-clock live video feeds for news, events, and social media sites and support a high volume of subscribers in real time. · Mobile video delivery to Flash Lite 3 - Deliver both live and video-on-demand streams to a growing number of mobile phones that support the Adobe Flash Lite 3 mobile platform. The same video experience in the browser can now be delivered smoothly to mobile devices. · Bandwidth detection - Detect the client connection speed and serve up video at the appropriate bit rate â€' no "choose size of video" messages to your end users. · Multipoint publishing - Use multipoint publishing to remotely inject new live or prerecorded streams into your delivery system to quickly add time-sensitive content. This is most useful when working with a content delivery network (CDN) or distributed servers. · Server redirection handling - Automatically provide clients with new or alternate locations of missing content. Stream redirection in RTMP behaves much like HTTP 302 redirection. · Logging - Help ensure that you have all the tools you need to track and generate reports on your audience's content usage thanks to W3C-compliant ASCII logs, a real-time usage monitor, and a complete API for server and stream events. · Stream data access - Create dynamic thumbnails or video previews on the client side with the ability to take a snapshot of the streamed video (requires Flash Player 9 or later). · This free Development Server is designed for you to use to evaluate and deploy small scale solutions. There is no expiration time period and it contains all of the features and functionality found in a full version of Flash Media Interactive Server. However, it has a capacity ceiling of no more than 10 simultaneous. You cannot download any crack or serial number for Adobe Flash Media Interactive Server on this page. Every software that you are able to download on our site is legal. There is no crack, serial number, hack or activation key for Adobe Flash Media Interactive Server present here. Our collection also doesn't contain any keygens, because keygen programs are being used in illegal ways which we do not support. All software that you can find here is freely downloadable and legal. Adobe Flash Media Interactive Server installation package is prepared to be downloaded from our fast download servers. It is checked for possible viruses and is proven to be 100% clean and safe. Various leading antiviruses have been used to test Adobe Flash Media Interactive Server, if it contains any viruses. No infections have been found and downloading Adobe Flash Media Interactive Server is completelly problem free because of that reason. Our experts on malware detection tested Adobe Flash Media Interactive Server with various spyware and malware detection programs, including fyxm.net custom malware and spyware detection, and absolutelly no malware or spyware was found in Adobe Flash Media Interactive Server. All software that you can find on our servers, including Adobe Flash Media Interactive Server, is either freeware, shareware or open-source, some of the software packages are demo, trial or patch versions and if possible (public domain licence), we also host official full versions of software. Because we want to be one of the fastest download sites on the web, we host all the software including Adobe Flash Media Interactive Server on our servers. You cannot find here any torrents or download links that would lead you to dangerous sites. 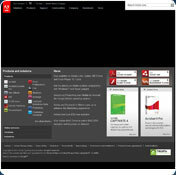 Rate Adobe Flash Media Interactive Server 3.5!